Growing up in Washington, DC, one of my favorite places to go was to the Foucault Pendulum in the Smithsonian’s Museum of Natural History. I could stand there for hours, mesmerized by the consistent movement of the pendulum, swinging back and forth, moving around the circle as the floor, not the pendulum, rotated with the earth as it spun on its axis, but always—always—coming back through the center. (The purpose of a Foucault Pendulum, in case you are unaware, is to demonstrate the earth’s rotation, not how pendulums move; but, truthfully, that is not what fascinated me.) The pendulum didn’t tarry on the sides, and it didn’t favor one side or the other. The one constant, no matter where it seemed to swing, was the middle. It didn’t rest in the middle; but that was the one common ground. Today, it appears that we favor the extremes, the edges of the circle rather than the middle. In so doing, we miss the compromise. And though the compromise is important, it is merely the end – the means to that compromise is that which we should all seek. As humans, we get to the end goal of compromise through conversation, through listening to others and really hearing what they have to say. We get to compromise by moving beyond the labels attach to people, because labels prevent us from seeing, from looking deeply and carefully, from being open to what is there, as opposed to what the label says is supposed to be there. 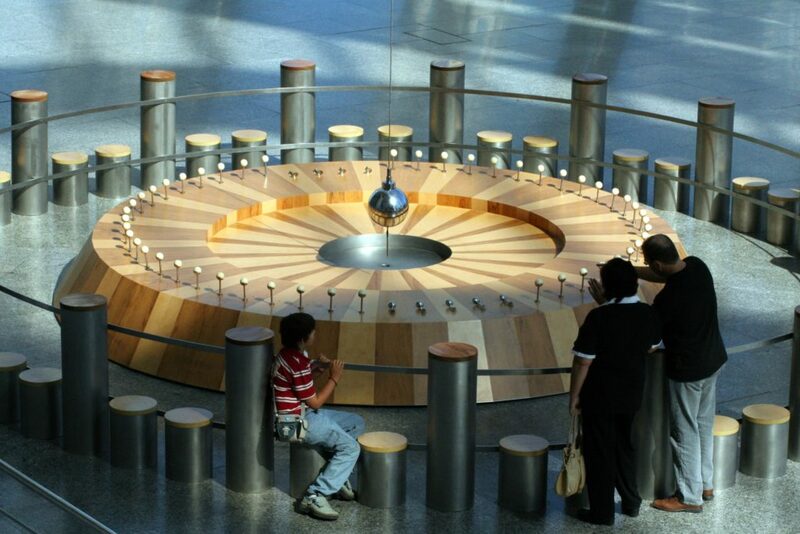 Take, for example, Foucault’s Pendulum. Most people see the pendulum moving, swinging back and forth, and assume that, of course, it is the pendulum that is traveling the 360 degrees around the circle, moving from point to point. But the reality is—a reality that is easily discovered by taking the time to read or to listen to the adult explain it to a four-year-old child—that the pendulum doesn’t change its course at all. It keeps swinging from the same point A to the same point B, all day, every day. Rather, it is the earth that is moving, and with it the entire building giving the appearance that the pendulum goes from point A to point B to point C to point D, etc. when, in fact, is it the floor of the building (well, actually, the whole building) that is moving as the earth is spinning on its axis. A quick look and the assumption that you know what you saw leads to a totally false understanding of reality. I confess to being shocked. I didn’t understand what she was talking about. People are so much more than the label of their political affiliation. Besides, a Democrat could be centrist or conservative; libertarian or progressive; blue dog or yellow dog, etc. Republicans are just as multi-faceted, ranging from Christian right and libertarians; neoconservatives and progressives; traditionalists and moderates, and this list, too, goes on. Smacking a label of one or the other on someone tells us nothing of substance about the person. But in so doing, we almost guarantee that nothing of substance will ever be learned about that person. Sadly, the faster we put a label on someone, the sooner the talking, listening and learning stops. When talking stops, we will never get to hear someone’s story. Recently, in an evaluation following one of our events, The Nonprofit Center was criticized for the lack of diversity of our core staff. Given that this person does not know any of us, the only place we lack diversity is in skin color. If diversity is defined solely by skin color, then, yes, we are not diverse, as only 14% of our core staff does not have white skin. But if someone took the time to hear each of our stories, s/he would learn how diverse we really are—diverse in ways that are not apparent to the naked eye but are just as powerful in their influences on who each of us is today, how we think and behave, how we view the world, what we expect of and from others, etc. And as long as I have worked with these wonderful people—some longer than with others—and appreciated and benefited from all of our diversity, I recently learned even more about them and our extended staff when one of our consultants took all of us through a potent session on power and privilege. A man of color, the consultant never once spoke of skin color, but rather through a series of exercises asked about going hungry, access to education, the dynamics of our families of origination, and more. He allowed us to see the sources of our diversity that went beyond our outward appearance and, in doing so, revealed or reinforced, depending upon where each started, to anyone listening and looking, that there is far more to diversity than what first meets the eye and the ear. Nonprofits are thought to be the caretakers of society. We are the ones who are expected to look out for it, care for it, nurture it. If we want to continue to prove this true, then we must lead the work of moving away from labels and quick assessments and do the hard work of really understanding—and then changing.